In The Sheriff of Fractured Jaw, Kenneth More stars as Jonathan Tibbs, the errant nephew of Lucius (Robert Morley), the pompous and irascible owner of Tibbs and Co., gunsmiths since 1605. Giving up his malfunctioning invention of a “horseless carriage” (it will never catch on), Jonathan instead reluctantly takes his place in the family firm. But he has just the idea to turn its fortunes around. Since the American Wild West is full of outlaws, gunslingers and is having trouble with “a frightful female outlaw named Jessie James”, it seems like just the place to sell his company's wares. Why, the premium products of Tibbs and Co. could bring just the touch of class these colonials need! So Jonathan sets off for the wild west, ending up in the frontier town of Fractured Jaw. There he is attacked by Indians, finds himself in the middle of a gang war, and is tricked into becoming Sheriff by the town's wily mayor and general store owner (Henry Hull). Tibbs is aided by his new invention, an automated, mechanical, quick-draw derringer, designed to be thrust into his hand when he flexes his arm muscle. This gives him the appearance of being the quickest gun in the west, with the derringer appearing at both opportune and inopportune moments. Staying in town to be its Sheriff also has its compensations, mainly the attractive saloon owner, Kate (Jayne Mansfield). Kate doesn't know quite what to make of Tibbs, but he sure does talk purty. The Sheriff of Fractured Jaw is an amiable comedy that relies heavily on the easy charm and British pluck of its star, Kenneth More. The film was based on a short story by Jacob Hay that was first published in McLean's magazine in 1954. The story was adapted by the blacklisted writer Howard Dimsdale, using the pseudonym “Arthur Dales”. Comedy westerns often use the premise of the tenderfoot out west, or the mild-mannered man mistaken for a fearless sheriff or ace gunslinger. The Sheriff of Fractured Jaw involves both those elements, but adds More's Englishness as an extra ingredient, mostly defusing problems with his “Now look here, you can't do that sort of thing” attitude and giving his enemies are jolly good talking to. The misunderstandings and complications are familiar from previous tenderfoot comedies like Destry Rides Again (1939) and The Paleface (1948) and from Englishmen-out-west comedies like Ruggles of Red Gap (1935). The screenplay gets More's character into mostly predictable situations and the humour is mild but occasionally funny. It relies a lot on the breezy charm and likeability of Kenneth More and his performance gives the film much of its appeal. His co-star, Jayne Mansfield, seems less comfortable as the saloon owner Kate. She gets to “sing” a few numbers, although she is obviously dubbed (by Connie Francis, who also sings the theme song). These slow the pace a bit, especially her song and dance routine in the saloon bar, complete with incongruously elaborate costumes that don't seem quite in place for a grubby, wild west saloon. 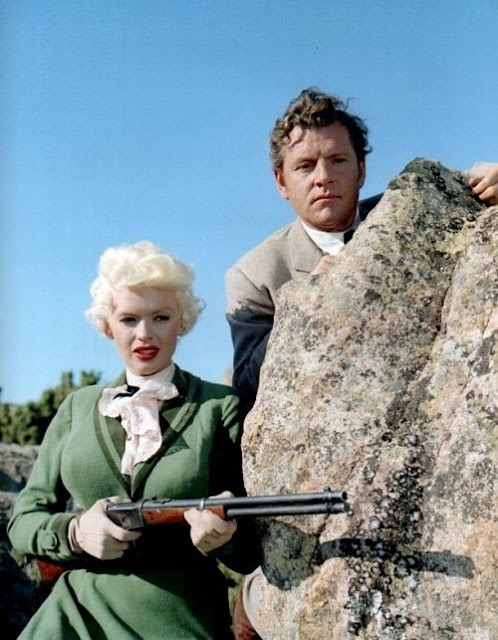 There's also some unintentional amusement to be had from the unlikely romantic pairing of Jayne Mansfield and Kenneth More. The two leads, perhaps unsurprisingly, have no chemistry at all. The romance between their two characters is not believably developed, with Mansfield going from mild bewilderment with More to enthusiastic acceptance of his accidental proposal in a matter of minutes. There are also some jarring bits of back projection in their exterior sequences and the looping of Mansfield's dialogue, in particular, is very obvious in some early scenes, giving her a booming, slightly disembodied voice. The film is notable for a couple of reasons, neither of which is immediately apparent on a casual viewing. The first is that, despite appearances, the film is a British production, although one obviously aimed at the American market. It was produced by Daniel M. Angel, an independent producer best known for war dramas The Sea Shall Not Have Them (1954), Reach for the Sky (1956) and Carve Her Name with Pride (1958). Angel had a distribution deal at the time with Twentieth Century Fox. This allowed the film to be made in Fox's wide screen format, CinemaScope, and provided Angel with his American star, Jayne Mansfield, who was under contract to Fox. 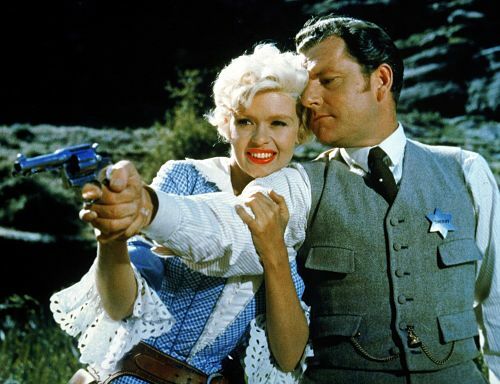 Angel teamed her with Kenneth More, the star of his biggest hit, Reach for the Sky. Other than the casting of More and the opening scenes in England, there are few signs that this wasn't a traditional Hollywood effort. One clue that the film wasn't made in the US is the presence of Sid James as the drunken passenger on board the stagecoach, in the scene where the Indians first attack. Coincidentally, Sid James would star in probably the most famous British comedy-western, Carry on Cowboy in 1965. A very young Steven Berkoff also supposedly appears in the studio scenes as an extra. The film's interiors were filmed at Pinewood Studios in England, but the film does a good job at replicating the look and feel of an American western. This is aided by the use of American character actors, including Henry Hull, Bruce Cabot and William Campbell, the latter as overly-friendly gunslinger, Keeno. As a result, we're mostly spared seeing British actors struggling to play cowboys. The producer also enlisted Raoul Walsh, an American director with plenty of action and western experience. Walsh was an impressive 71 years old when he made the film, and wouldn't retire from directing for another 6 years. It was Walsh who recruited his old friend Henry Hull to the cast, and this was their fifth and final film together. The rest of the crew were largely drawn from the British industry and include cinematographer Otto Heller (The Ladykillers, The Ipcress File and Olivier's Richard III), costume designer Julie Harris (A Hard Day's Night, The Wrong Box, Live and Let Die), editor John Shirley (who worked on the same producer's Reach for the Sky and Carve Her Name with Pride), and art director Bernard Robinson, a Hammer regular whose credits include the Hammer versions of The Curse of Frankenstein (1957), Dracula (1958) and The Mummy (1959). An original US poster. Blacklisted screenwriter Howard Dimsdale is credited as "Arthur Dales"
The other reason the film is notable is because it was the first of many westerns to be filmed in Spain. This would become the favoured location of British-produced westerns, including The Singer Not the Song (1961) and Shalako (1968), but became better known as the location for spaghetti westerns in the 1960s and '70s, including Sergio Leone's A Fistful of Dollars (1964) and its sequels. The Spanish locations are not unattractive and make for a good substitute for the American west. A pre-fabricated western town set was put together by Fox and shipped out to the location in Spain. The original reviews were mixed, but there were some enthusiastic ones, including a rave from Variety. The film's prospects at the box office were not helped when Daniel M. Angel joined with another British producer, John Woolf, to sell 55 of their films to television. This incurred the displeasure of the British exhibitors, who boycotted their films. The film's distributor, Twentieth Century Fox, persuaded the exhibitors that Angel no longer had any financial interest in the film and removed references to him in publicity materials. The exhibitors eventually relented and the film seems to have been reasonably successful in the UK, where it was in the top ten attractions of 1959. 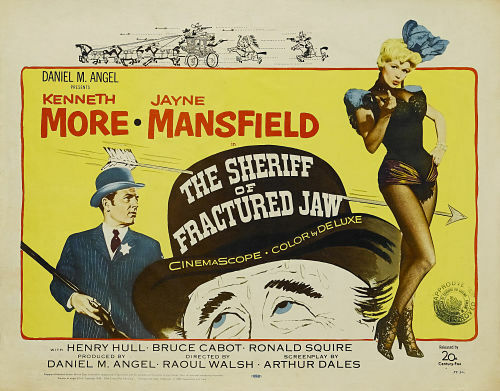 The Sheriff of Fractured Jaw is a mild entertainment that ambles along in an agreeable fashion, thanks largely to More's likeability and good humour, and it will probably appeal more to his fans than to Mansfield's. It isn't a classic film, but it's a pleasant and easygoing comedy that occupies its own niche in film history, even if it's one that isn't often appreciated. a ckmment is added I get three emails with the same comment. Is there any way you cann remove people from that service? Thanks! I'm not sure what's causing that, but I'll look into it.